So this small sample is my first book using the Bookify application recently introduced by Blurb. Bookify is the online application for creating a book. I know there was much demand for this, and after tinkering with it while making this sample…my mind is racing with all the potential uses. Up until this point, your options for creating a book with Blurb were to utilize either Booksmart, the download software, or using something like InDesign to create a PDF. Now we have another option. Making a book with Bookify is streamlined, but I see this as a help more than anything else. For me, I’ve got to get better at InDesign because I want to utilize that more for the future, but at the same time I love the ability to make something quick and easy, and online. This is a perfect way to share small bodies of work, or collaborate with someone in another location. If you haven’t checked it out, just to to Blurb and give it a go. PS: If you haven’t noticed, this is a small dose of work from Panama, all color, all 35. This is not a book I’m intending to sell or promote, it was just a sample book to test out Bookify. I am working on a portfolio book from Panama, until another title, but will also not try to market or sell that book. Just wanted to make something that represents my trip. PSS: You can click on the full screen button if you want to see the book at that size. Don’t know if you know about Pictory? I was just introduced to them a few weeks ago by someone at Blurb. They told me grand stories, about the coolness, the funk, etc. So, being the interested guy I am, I checked it out. I noticed they had a feature about water and I submitted a snap. So when my email alarm laser defense system went off with an email from Pictory Command Central I thought some positive things might happen. Low and behold…they featured my image. Just completed an interview, 78 minutes, with Scott Anderson at Foliopodcast. I had never met Scott before, but immediately felt at ease with him, and I thought he did a masterful job of asking questions, doing research, etc. If you have some time, give it a whirl. This is what a typical “set” looks like on Flickr, and for some reason, I really like it. Simple clean, etc. I have never liked thumbnails, but when you can see them all as a page, I like it. 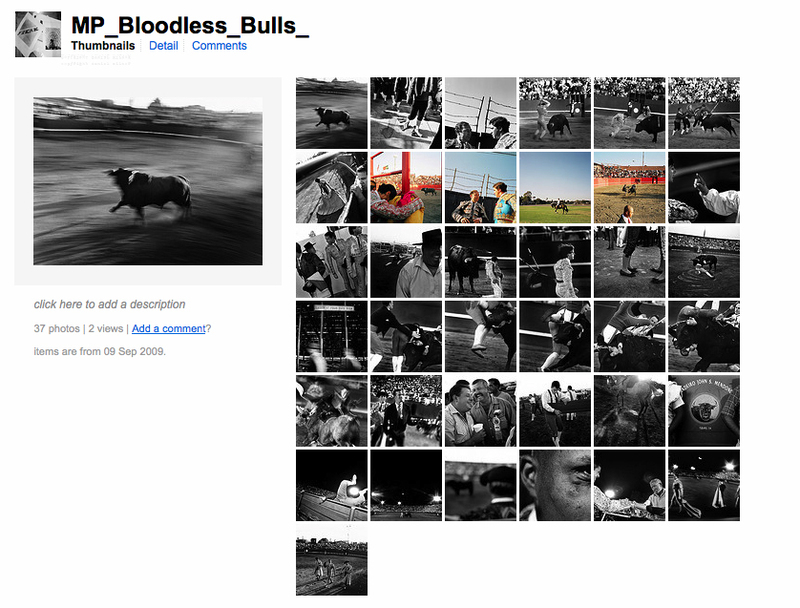 What I don’t like is the Flickr navigation with one image at a time, at full size. Wish there was a better way.